If you're not already a member of AFP, we invite you to join! With your membership, you will enjoy a wealth of career-building programs, educational resources, networking opportunities and exclusive member discounts. Ready to Join? Let's Get Started! Now, more than ever, you must invest in yourself! And it’s your professional community, the Association of Fundraising Professionals, that can offer you the best resources—at the best value for your membership dollar—to help you and your organization succeed. Many AFP members enjoy the benefit of their employers paying their membership dues. In this extraordinary period, many organizations are trimming their budgets wherever possible and membership dues are being cut. However, it is precisely during these uncertain times that your professional association offers you the most value and assistance. If your employer is cutting membership dues from the budget, consider the investment you now need to make in yourself. If you can’t pay your dues on your own, think about approaching your employer regarding a shared payment arrangement. You can each pay for a portion of your dues until the economy settles down. Sharpening your skills, connecting with other fundraisers and figuring out how to do more with less is at the top of everyone’s list. And AFP is committed to helping you and your organization succeed! What can AFP provide to help you succeed? The best training and education in the field. 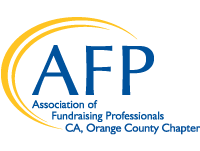 AFP offers a myriad of continuing educational opportunities for all fundraisers, regardless of experience level or specialty, and most can help you attain your certification to demonstrate your commitment to and expertise in the profession. New ideas and latest trends in the profession. Between our weekly eWire, the bimonthly Advancing Philanthropy and our constantly updated website, AFP keeps you current on happenings and innovations that will affect you now and in the future. Networking with colleagues and access to experts in the field. AFP Webinars let you hear from the most experienced practitioners in fundraising, and online forums let you talk directly with fundraisers with a wealth of practical, how-to knowledge. Networking through your local chapter can bring new opportunities every day! Benchmarks for success and future growth. AFP research data, such as the State of Fundraising Survey and Compensations and Benefits Analysis, show how you and your organization stack up in the profession and how to proceed to find even greater success. Showing the public your commitment to ethics and accountability. AFP’s Ethics program, featuring our Code of Ethical Principles and Standards and the Donor Bill of Rights, is the most respected in the world and underscores what you and your organization does to steward not just the public’s money, but its trust as well. Reaching out to a growing and diverse donor base. AFP’s diverse resources not only help organizations reach out to different audiences, but also help build inclusive boards that can more effectively serve different populations. Understanding how public policy affects the work of fundraising and charities. AFP is the leader in educating government on how fundraising really works and what charities need to succeed. Our public policy program works for stronger philanthropic incentives for your organization and a streamlined oversight system that protects legitimate organizations while rooting out the bad apples. Developing fundraising leadership. Successful boards and staff that know and appreciate fundraising are key ingredients to success. AFP’s executive programs develop management and leadership skills and help forge the critical bonds between staff and board that result in exceeding fundraising goals. AFP is committed to your success and the success of your organization. There is no doubt that these are challenging times, but you still have the power to control your own fundraising career, and AFP can help. At the same time, your membership in AFP helps to advance the overall fundraising community. Belonging to AFP sends an important message to the world that the fundraising profession is united and cares about issues such as ethics and public trust. We are committed to the highest level of service to our donors and the people we serve. We are proud of the work we do and are committed to changing the world. By joining AFP, you stand united with more than 30,000 fundraisers, each member making our voice stronger and more powerful when speaking with the government and media around the world. And as your profession grows stronger, so too does its impact on the world. You and your organization can benefit from all of this. So continue to invest in yourself. Work with your organization so you can continue to be a vital part of the AFP community. And let AFP—your association— help you reach your professional development goals—while helping your organization continue to make a difference in the world. Below are major benefits you'll receive when you join the Association of Fundraising Professionals. Sound good? Then Join AFP and become a part of the world's largest community of charitable fundraisers. Please note: Collegiate, Global, Young Professional and Small Organizational members automatically receive the digital magazine only. Have questions about AFP membership? The FAQs below should answer them. If you have more, please contact the Member/Chapter Services Department at AFP International Headquarters, (800) 666-3863. Does my membership belong to me, or to the organization I work for? It depends on the type of membership that you join. If you are a Professional, Young Professional, Global eMember, Collegiate or Associate member, the membership is yours and goes with you if leave an organization. The Nonprofit Organizational Membership for both large and small organizations, and the Executive Circle Business Member or Endorser Business Member belongs to the organization or company. If an employee leaves, the organization may replace the name of the designated member. New members still need to fill out a membership application and sign their adherence to the AFP Code of Ethical Principles and Standards. Does my membership stay with me if I switch organizations? If you are in one of the individual membership categories the membership goes with you if you switch organizations. When a member joins AFP, he or she joins both the international organization and a local chapter (exceptions exist if a chapter is not located close to the member). Thus, a member pays annual dues to both the International Headquarters and the chapter. How much are the dues to International Headquarters? Your membership dues depend on the type of membership applicable to you. Members must self-assess to determine the type of membership for which they are eligible. Prospective members should self-determine the category of membership, and renewing members should review and reassess membership categories. Descriptions are below. Professional: Open to persons who hold some degree of responsibility directly for fundraising, work within the U.S. and Canada and are compensated for their services (Members outside these two countries may join in this category as a volunteer fundraiser); subscribe to the AFP Code of Ethical Principles and Standards ("Code") and its bylaws; promote the Donor Bill of Rights and, are employed or have been employed by an institution or organization that provides benefits to society. Associate: May be extended to persons who are engaged in fields related to fundraising, volunteers, or those who have mutual interests with fundraising professionals, and who subscribe to the AFP Code of Ethical Principles and Standards and its bylaws; and promote the Donor Bill of Rights. Young Professional: Open to persons who hold some degree of responsibility directly for fundraising, work within the U.S. and Canada and are compensated for their services, and are 30 years old or younger, must subscribe to the AFP Code of Ethical Principles and Standards and its bylaws and promote the Donor Bill of Rights and be employed, or have been employed by an organization that provides benefits to society. Global e-membership in the Association shall be open to members outside of the U.S. and Canada who wish to join in an electronic-only based membership category. Global e-membership members must subscribe to the AFP Code of Ethical Principles and Standards and promote the Donor Bill of Rights. Collegiate: Collegiate membership in the Association shall be open to (a) students in a two- or four-year full time degree granting, certificate, or diploma program at an accredited college or university, or (b) individuals who serve as a faculty advisor for a collegiate chapter of AFP. Collegiate members must subscribe to the AFP Code of Ethical Principles and Standards and promote the Donor Bill of Rights. Membership in this category is limited to those students affiliated with a Collegiate Chapter of AFP. Retired: Retired membership in the Association shall be open to individuals who no longer practice as paid fundraising professionals but who, at the time they seek Retired Member status, have been Professional members of the Association for the immediate past five consecutive years and subscribe to the AFP Code of Ethical Principles and Standards and promote the Donor Bill of Rights. Business: Business membership in the Association shall be open to for-profit organizations whose work complements the fundraising profession. The Executive Circle Business member shall be entitled to designate two employees to receive full benefits as Associate members of the Association. Endorser Business Members shall be entitled to designate one employee to receive full benefits as an Associate member of the Association. The designated individuals, as well as the organization which constitutes the Business member, must subscribe to the AFP Code of Ethical Principles and Standards and promote the Donor Bill of Rights. Nonprofit Organizational – Large: Shall be open to nonprofit organizations who wish to have multiple members in the association. The organization will designate a minimum of eight (8) to receive Professional member benefits. The memberships may be transferred to another individual if the original member leaves the organization. Must subscribe to the AFP Code of Ethical Principles and Standards and promote the Donor Bill of Rights. Not affiliated with a larger institution supporting their operations. The organization will designate one fundraising professional to receive the benefits offered in this membership category. The membership may be transferred to another individual if the original member leaves the organization. Must subscribe to the AFP Code of Ethical Principles and Standards and promote the Donor Bill of Rights. Limit one membership per organization. How much are chapter dues? Chapter dues vary from $25 to $125, depending on the chapter. Click on Join AFP to determine chapter dues. How can I find out if there is a chapter in my local area? Search in the Chapters section or contact the AFP International Headquarters at (800) 666-3863. Your membership lasts 12 months, starting in the month you officially become a member.